The concept of reversible cymbals isn’t exactly new, and mixing and matching hi hat cymbals will have been around longer still. However, I can’t really remember, in the last thirty years, many companies exploring the concept of interchangeable cymbal packs. The idea behind the Trihats is to provide a more diverse sonic palette, which is also quickly and easily accessible. The three cymbals in each set allow for six different combinations of sounds to be available. TriHat Elements set, 14” Bliss Bottom, Contact Top, Energy Top. Both versions come with bag and an extra clutch, both of which are of a decent quality. I was sent the Diversity set. The cymbals themselves all differ in weight and design, although they all have quite high profile bells. You will be able to see them in the video. 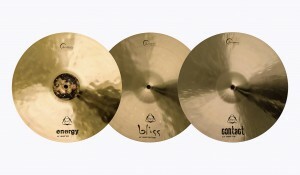 The Energy cymbal is the heaviest of the three. It is hammered but unlathed and because of this is quite dry and pingy. The Contact cymbal is in the middle of the three weight-wise but is not that much heavier than the Bliss model, although it is a bit thicker. Unlike the Bliss model though, it has wide lathing grooves and not much hammering applied, from what I could see. The Bliss cymbal is quite thin. It has much tighter lathing grooves and more obvious hammering giving a darker sound than the other two. In terms of using the Trihats in pairs, certain combinations are more obvious; the first two cymbals as bottoms (they were actually marked as bottoms anyway) with the Bliss on top, for perhaps more ‘traditional’ sounds. Then you have the possibility of the two heavier models together for a more crunchy sound. Concept-wise, I think this is a great idea. This is something that could probably appeal to all levels and budgets, the latter particularly, because with the addition of the one cymbal you get four more possible sound combinations against the normal two. And, given that the Trihats are quite reasonably priced too, this would make them more appealing to those looking to expand their cymbal collection or the more creative player who wants to change sounds between songs. The cymbals I had were all well made and the bag and extra clutch are both nice additions and a good idea. The bag itself would easily slot into an existing cymbal bag. Dream dealers are having a UK launch of the Trihats on the 12th of May 2017. The launch day involves the stores listed at the link below as well as a few store appearances from Dream artists to demonstrate the TriHats. For more info, head over to www.dreamcymbals.co.uk or email contact info@dreamcymbals.co.uk.